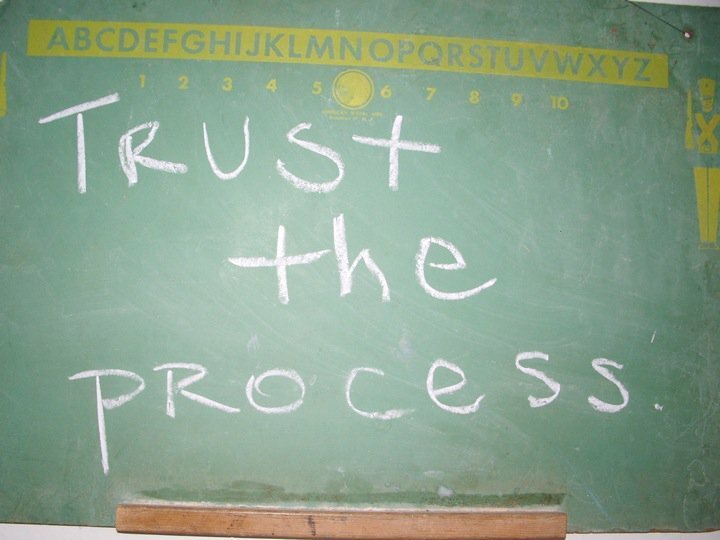 “Trust the process” is one of the most frequently used phrases in modern personal development. When I hear it I usually shudder, partly because it is so overused, partly because I have been previously asked to trust a process that didn’t warrant trust, and yes, I too have asked people to trust a process. As is often said, never trust the person who says “trust me”. If someone needs to qualify their trustworthiness by declaring it, that is the time to start questioning. The phrase is usually used by a facilitator who understands the process a participants is in. They have knowledge of the process, its design, methods and what is coming up. For them, they are able to trust the process because they know what the process is. What is often not recognised by facilitators who use this declaration, is that they are in a position of power. When you have knowledge that your group does not, and the ability to make decisions that will impact their experience without their knowledge, awareness or consent, this creates a strong power differential. Knowing and respecting the power differential between a facilitator and a group is a critical skill. When a facilitator pulls out the phrase, “trust the process”, it is usually because they have seen or heard signs that someone or a number of people are in fact having difficulty trusting the process. Telling them to “trust the process” is not going to work to restore that trust. Usually something would have occurred which has led them to disconnect in trust of either the process or the facilitator. The possible triggers are numerous and won’t always be immediately obvious. It could indeed be something that occurred outside of the group or process, like a doubt that emerged for them in the meantime, a friend questioning the program or otherwise. It may simply be that the group or individual has a need that wants to be met, which the process as it is currently being delivered is not catering to. It may also occur through a disconnection in relationship with another person in the group. More significantly, it may have occurred through a disconnection between the participant and the facilitator. Due to the influential role that the facilitator plays, he or she may have said or done something that the participant was impacted by. This may not have occurred with poor intent by the facilitator, indeed, the facilitator may not always be aware that such an event occurred. What is important here is noticing when this disconnection occurs – either in the relationship, or in the possible lack of trust in the process. Acknowledging that disconnection or how the participant/s have perceived the process or experience is critical. Giving them a chance to discuss and build meaning and understanding around what they are doing, why they are doing it, and where they exist in the process is important. Sometimes educators and facilitators design processes purposefully to have elements of surprise in them. While I believe it important to provide a meta-frame in which participants can locate their experience is important, there are times when I may want to leave some aspects of the agenda a surprise in order to scaffold the learning, or indeed allow me to adjust as I go. The key for me is to remember that I am in this role to serve the group and the clients I am working with. I have designed the process to serve their best interests. If along that journey a greater level of insight, disclosure or otherwise is warranted, then I have a duty to go there. Safety is key. To be able to trust someone or a process, then the person doing the trusting needs to feel safe. When trust or safety is broken, or disconnection occurs, it is the facilitators role to halt the process to see that safety and trust is restored. Equipping participants with techniques to do this is an important role of the facilitator. It should not be assumed that all people coming into a process will have the ability to respond to moments of disconnection or grievance. Outlining your role as a facilitator and how participants can have their needs heard is important. This may be through providing avenues to meet outside of the group process, or to be able to address concerns through a supervisor or colleague. Also explicitly acknowledging that students have the right to vote with two feet and leave whenever they feel uncomfortable. To qualify my opening remark – don’t trust the process – surrender to a well designed and facilitated process can be incredibly transformational and rewarding. Being able to trust it is a wonderful thing if you can go there. So it is not necessarily about never trusting a process. The key is to learn to trust your own inner guidance and what feels right for you. Notice how you are tracking, what is coming up for you and when disconnection occurs. Name this for yourself and take appropriate action – whether that be to name it with the group, the facilitator or simply take action by leaving. You are leading your own process – learn to trust yourself.